Columns and rounded room entrances present this home as both formal and playful. To add an extra layer of architectural interest to a standard floor plan, architect Jan Gleysteen creates detail with millwork, rounded openings between rooms, and varied ceiling treatments. 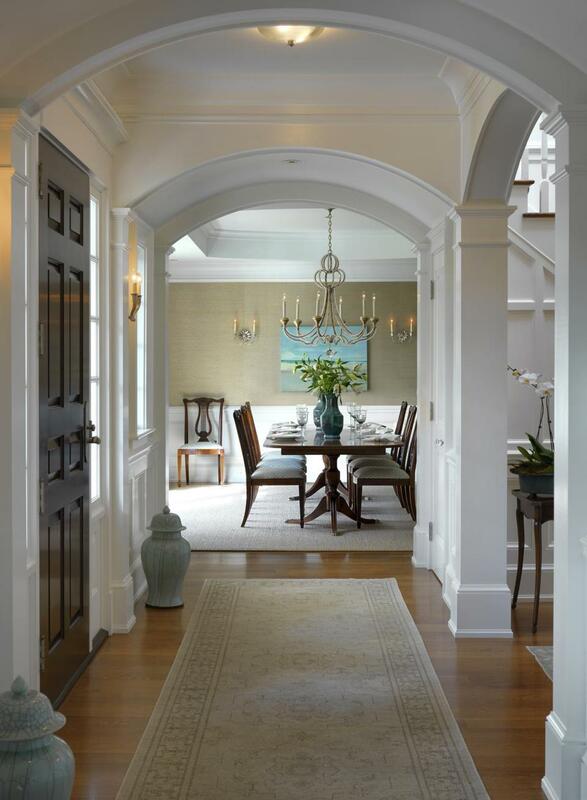 In the entryway to this Wellesley home, columns and curved beams have a dramatic impact. Oversize arches lead to the dining room and front stairs hall. “The woodwork has been upgraded from a normal door casing and straight beams — which would have felt stiff — to this combination of columns and curved elements, which has some formality paired with a more playful treatment,” Gleysteen says. 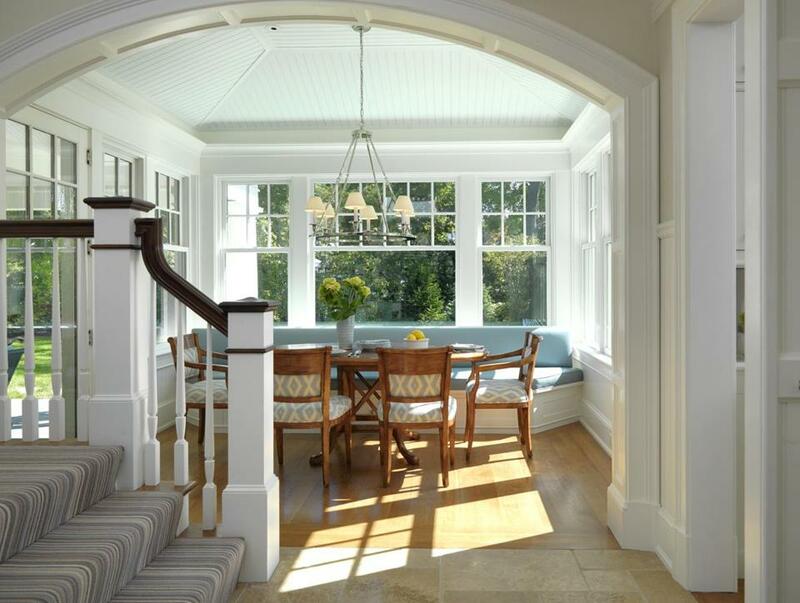 Off of the kitchen, the scale of the millwork in the breakfast room was increased to emphasize the informality. An expansive curved opening was added to highlight the room’s open, airy appeal. Oversize casings above the windows are 6 inches high. “In the rest of the house the casings are 4.5 inches — in a standard house, they’re about 3.5 inches,” says Gleysteen. The cathedral ceiling is sheathed with five interlocking bead board panels that create an illusion of being curved. Painted a light shade of the “robin’s egg blue,” commonly used on porches in the 19th century, “the bead board was used to make the breakfast room feel like a special space, almost as if you are in an outdoor gazebo,” Gleysteen says. The mudroom is dressed up with wainscoting that stretches 5 feet high. Every family member has a cubby with hooks and an ample drawer sized to stash shoes. The bead-board treatment used in the breakfast room is repeated in the cubbies. “Located by the back entry to the house that the family uses, we wanted to have some elegance to the space as well as practicality and functionality,” says Gleysteen, noting the striking glass chandelier that draws the eye up. The ceiling in the mudroom is dropped a foot from the adjacent kitchen. The small portion of the ceiling from which the chandelier hangs was carved up a foot to create ceiling architecture.